DEPRECATED: Please see http://arctosdb.org for current information. Arctos is both a community and a comprehensive collection management information system. As a community, it is a collaboration among multiple scientific collections that serves data on over 3M natural history museum records. Approximately half of those records are in a shared instance hosted at the Texas Advanced Computing Center (view institutions and holdings). The remaining specimens and collections are in MCZBase, a single instance at the Museum of Comparative Zoology, Harvard University. Arctos users contribute to data standards, application enhancements, and improved data quality through sharing of authorities for taxonomy, geography, people names, part types, and other data. Arctos’ multidisciplinary collection management information system integrates access to diverse types of collections (botany, entomology, herpetology, mammalogy , ornithology, paleontology, parasitology) and data, including specimen records, observations, tissues, endoparasites and ectoparasites, stomach contents, fieldnotes and other documents, and media such as images, audio recordings, and video. This system is intended for use by collection managers, curators, collection users, scientists, educators, and anyone interested in natural history information. In addition to rigorously displaying all that is known about a museum record, Arctos provides solutions to managing and integrating collections data with object tracking (via barcodes or RFID tags), transactions (loans, borrows, accessions, permits), geospatial information (coordinates and descriptive data), agents (people and organizations), and usage (publications, projects, and citations). Arctos is deeply integrated with external internet resources. 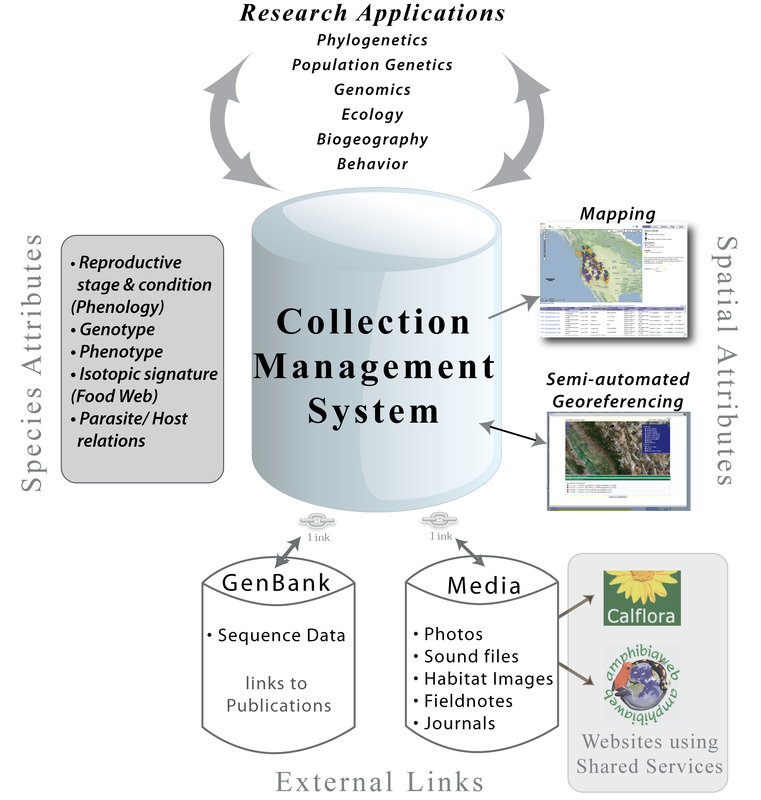 It was the first collection management system to develop reciprocal linkages between specimens and sequence data in GenBank, thereby establishing the current standard for specimen-specific unique identifiers. GEOLocate provides embedded, graphical one-click georeferencing of localities, which are mappable using Google Earth, Google Maps, or BerkeleyMapper. The Texas Advanced Computing Center (TACC) provides media hosting and processing, including automated Optical Character Recognition (OCR) on text (e.g., herbarium sheet images). Arctos data are continuously updated and accessible to the public through its strong web presence. Records also are accessible through distributed data network portals such as VertNet (which includes MaNIS, HerpNET, ORNIS, FishNet2) and the Global Biodiversity Information Facility (GBIF). The collaboration between Arctos and VertNet (read blog post) offers a particularly rich potential for asking multidisciplinary questions about biodiversity and how it has changed, or might change, through space and time. Other Identifying Numbers (Other IDs) and Relationships.